For the U.S. Navy vessel named after this person, see USS Gabrielle Giffords. Gabrielle Dee Giffords (born June 8, 1970) is an American politician from Arizona and a gun control advocate. As a Democratic member of the United States House of Representatives, she represented Arizona's 8th congressional district from January 3, 2007, until her resignation on January 25, 2012, after surviving an assassination attempt that left her with a severe brain injury. She is the third woman in Arizona's history to be elected to the U.S. Congress. Considered a "Blue Dog" Democrat, her focus on health care reform and illegal immigration were sources of attention for those opposed to her candidacy and made her a recipient of criticism from various liberal groups. Giffords is a native of Tucson, Arizona, and a graduate of Scripps College and Cornell University. Prior to her election to the United States Congress, Giffords served in the Arizona House of Representatives from 2001 until 2003 and the Arizona State Senate from 2003 until 2005, when she resigned to run for the house seat held by then-Congressman Jim Kolbe. She also worked as an associate for regional economic development for Price Waterhouse in New York City, and as CEO of El Campo Tire Warehouses, a local automotive chain owned by her grandfather. She is married to former astronaut and Space Shuttle Commander Mark E. Kelly. On January 8, 2011, just a week into her third term, Giffords was a victim of an assassination attempt near Tucson at the hands of gunman Jared Lee Loughner, at a Safeway supermarket where she was meeting publicly with constituents. Loughner shot Giffords in the head with a 33-round-magazine Glock pistol; he shot twenty-four others, killing six and wounding eighteen, among them federal judge John Roll and a 9-year-old child, Christina-Taylor Green, before Loughner was disarmed, arrested, and charged with murder and attempted murder. Giffords was later brought to a rehabilitation facility in Houston, Texas, where she recovered some of her ability to walk, speak, read, and write. On August 1, 2011, Giffords returned to the House floor to vote and was greeted with a standing ovation. On January 22, 2012, Giffords announced her resignation from her congressional seat in order to concentrate on recovering from her wounds, but promised to return to public service in the future. She attended President Obama's State of the Union address on January 24, and appeared on the floor of the House on January 25, 2012, where she formally submitted her resignation to a standing ovation and accolades from her colleagues and the leadership of the House. Gabrielle Dee Giffords was born in and grew up in Tucson, Arizona; her parents were Gloria Kay (née Fraser) and Spencer J. Giffords. She was raised in a mixed religious environment, as her mother was a Christian Scientist and her father was Jewish. Her paternal grandfather, Akiba Hornstein, was a Jewish emigrant from Lithuania who changed his name to Giffords to avoid anti-Semitism in the United States. Through her father, Giffords is a second cousin of actress Gwyneth Paltrow and director Jake Paltrow. Giffords graduated from Tucson's University High School. She is a former Girl Scout. She received a Bachelor of Arts degree in Sociology and Latin American History from Scripps College in California in 1993; and spent a year as a Fulbright Scholar in Chihuahua, Mexico. She returned to graduate school, earning a Master's degree in Regional Planning from Cornell University in 1996. She focused her studies on Mexican-American relations. Giffords worked as an associate for regional economic development at Price Waterhouse in New York City. In 1996, she became president and CEO of El Campo Tire Warehouses, a local chain of auto service centers founded by her grandfather. The business was sold to Goodyear Tire in 2000. At the time of the sale, she commented on the difficulties local businesses face when competing against large national firms. Since 2001, she has practiced Judaism exclusively and belongs to Congregation Chaverim, a Reform synagogue, in Tucson. Giffords was elected to the Arizona House of Representatives and served from 2001 to 2003. She was elected to the Arizona Senate in the fall of 2002, and at the time was the youngest woman elected to that body. She took office in January 2003 and was re-elected in 2004. She resigned from the Arizona Senate on December 1, 2005, in preparation for her congressional campaign. In early 2005, Giffords observed that "the 2004 election took its toll on our bipartisan coalition" and that as a result "a number of significant problems will receive far less attention than they deserve." She highlighted among these, the lack of high-paying jobs or necessary infrastructure, rapid growth, and inward migration that threatened the environment and "strain[ed] […] education, health care, and transportation," and unresolved problems such as Students First; Arnold v. Sarn; repayments due under Ladewig v. Arizona; the No Child Left Behind mandate; low educational achievement; health care costs; and the demands of the Arizona Health Care Cost Containment System. She noted that Arizona was not alone in facing such challenges. Expanding health care access was an issue of interest for Giffords when she served in the legislature. She also pushed for bills related to mental health and was named by the Mental Health Association of Arizona as the 2004 Legislator of the Year. Giffords earned the Sierra Club's Most Valuable Player award. In the legislature, Giffords worked on the bipartisan Children's Caucus, which sought to improve education and health care for Arizona's children. Critics of this plan argued that it amounted to taxpayer-funded daycare. She worked with Arizona Governor Janet Napolitano to promote all-day kindergarten. Giffords supported raising more money for schools "through sponsorship of supplemental state aid through bonds and tax credits that could be used for school supplies." She was awarded Arizona Family Literacy's Outstanding Legislator for 2003. Giffords launched her first candidacy for the U.S. Congress on January 24, 2006. The campaign received national attention early on as a likely pick-up for the Democratic Party. Prominent Democrats, including Tom Daschle, Robert Reich, Janet Napolitano, and Bill Clinton, endorsed Giffords. EMILY's List endorsed Giffords early in the campaign cycle. The Sierra Club and the Arizona Education Association also endorsed her. On September 12, 2006, Giffords won her party's nomination in the primary election. Her Republican opponent in the general election was Randy Graf, a conservative former state senator known for his enforcement-only position on immigration and illegal aliens. Graf had run against Jim Kolbe in the 2004 GOP primary and had announced his candidacy in 2006 before Kolbe announced his retirement. The Republican establishment was somewhat cool toward Graf, believing he might be too conservative for the district. The national GOP took the unusual step of endorsing one of the more moderate candidates in the primary. Graf won anyway, helped by a split in the Republican moderate vote between two candidates. Not long after the primary, Congressional Quarterly changed its rating of the race to "Leans Democrat". By late September, the national GOP had pulled most of its funding, effectively conceding the seat to Giffords. Giffords won the race on November 7, 2006, with 54 percent of the vote. Graf received 42 percent. The rest of the vote went to minor candidates. Giffords's victory was portrayed as evidence that Americans are accepting towards comprehensive immigration reform. She was the first woman with a Jewish father elected to Congress from Arizona. In 2008, Giffords was elected to a second term. Republican Tim Bee, a childhood classmate and former colleague in the Arizona State Senate, ran against her. Bee was the President of the Arizona State Senate and considered a strong challenger in this race. Despite native son John McCain's running as the Republican presidential candidate, Giffords was reelected with 56.20 percent of the vote to Bee's 41.45 percent. On November 5, 2010, Giffords was declared the victor after a close race against Republican Jesse Kelly. Kelly, an Iraq War veteran (and not related to Mark Kelly), was listed as a top-ten Tea Party candidate to watch by Politico, and described by azcentral.com as highly conservative even compared to Sarah Palin. Giffords had been targeted for defeat by Sarah Palin's political action committee, SarahPAC. Giffords participated in the reading of the United States Constitution on the floor of the House of Representatives on January 6, 2011; she read the First Amendment. Following the November 2006 election, Giffords was sworn in as a congresswoman on January 3, 2007. She was the third woman in Arizona's history to be elected to serve in the U.S. Congress. In her inaugural speech on the floor of the House of Representatives, Giffords advocated a comprehensive immigration reform package, including modern technology to secure the border, more border patrol agents, tough employer sanctions for businesses that knowingly hire illegal immigrants, and a guest-worker program. In her first month in office, Giffords voted in favor of increased federal funding for embryonic stem-cell research; raising the minimum wage; endorsing the 9/11 Commission recommendations; new rules for the House of Representatives targeting ethical issues; and the repeal of $14 billion of subsidies to big oil companies, in favor of renewable energy subsidies and the founding of the Strategic Renewable Energy Reserve. During the 2007 session of Congress, Giffords introduced a bill (H.R. 1441) that forbids the sale of F-14 aircraft parts on the open market. Giffords advocated for a national day of recognition for cowboys as one of her first actions. She voted for the contentious May 2007 Iraq Emergency Supplemental Spending bill, saying, "I cannot, in good conscience, allow the military to run out of money while American servicemen and women are being attacked every day". She has also been a Girl Scout supporter for many years. 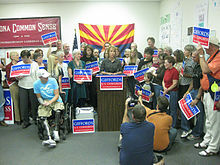 On April 21, 2007, Giffords hosted her third "Congress on Your Corner" in Tucson, Arizona, and kicked things off by speaking to the Girl Scouts of Southern Arizona, Sahuaro Council. Giffords was a member of the Blue Dog Coalition and the New Democrat Coalition. She was a co-founder of the Congressional Motorcycle Safety Caucus. Until her husband's retirement, she was the only member of the U.S. Congress whose spouse was an active duty member of the U.S. military. She is also known as a strong proponent of solar energy as well as for her work to secure the Mexico–United States border. 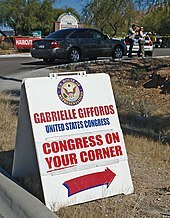 On January 8, 2011, Giffords was shot in the head outside a Safeway grocery store in Casas Adobes, Arizona, a suburban area northwest of Tucson, during her first "Congress on Your Corner" (a public opportunity for constituents to speak directly with their representatives) gathering of the year. A man ran up to the crowd and began firing a 9mm pistol with a 33-round magazine, hitting 19 people, and killing six. A 20th person was injured at the scene, but not by gunfire. The shooter, Jared Lee Loughner, was detained by bystanders until he was taken into police custody. As the shooting took place at a US government event, and federal employees were attacked, federal offenses were committed. Federal officials charged Loughner on the next day with killing federal government employees, attempting to assassinate a member of Congress, and attempting to kill federal employees. After eventually facing more than 50 federal criminal charges, Loughner pleaded guilty to 19 of them in a plea bargain to avoid a death sentence. Giffords's intern, Daniel Hernández Jr., provided first-aid assistance to her immediately after she was wounded, and is credited with saving her life. She was quickly evacuated to the University Medical Center of Tucson in critical condition, though she was still conscious and "following commands" at the time. On the same day doctors performed emergency surgery to extract skull fragments and a small amount of necrotic tissue from her brain. The bullet passed through Giffords's head without crossing the midline of the brain, where the most critical injuries typically result. Part of her skull was removed to avoid further damage to the brain from pressure caused by swelling. Doctors who first treated Giffords said the bullet entered the back of her head and exited through the front of her skull, but physicians later concluded that it had traveled in the opposite direction. Upon receiving a call from a staffer about Giffords's injury, husband Mark Kelly and his daughters flew in a friend's aircraft directly from Houston to Tucson. Giffords initially was placed in an induced coma to allow her brain to rest. She was able to respond to simple commands when periodically awakened, but was unable to speak as she was on a ventilator. Nancy Pelosi said Giffords's husband Mark Kelly acknowledged that there is a "rough road ahead" for his wife's recovery, but was encouraged by her responsiveness, which included the ability to signal with her hand and move both arms. U.S. Army neurologist Geoffrey Ling of the Uniformed Services University in Bethesda, Maryland, was sent to Tucson to consult on Giffords's condition. Ling stated, "Her prognosis for maintaining the function that she has is very good. It's over 50 percent." On January 11, neurosurgeon G. Michael Lemole Jr. said that Giffords's sedation had been reduced and that she could breathe on her own. On January 12, President Barack Obama visited Giffords at the medical center and publicly stated in an evening memorial ceremony that she had "opened her eyes for the first time" that day. Shortly after the shootings, some questions were raised by the media as to whether Giffords could be removed from office under a state law that allows a public office to be declared vacant if the officeholder is absent for three months, but a spokesperson for the Arizona secretary of state said the statute "doesn't apply to federal offices" and was, therefore, not relevant. As Giffords's status improved, by mid-January she began simple physical therapy, including sitting up with the assistance of hospital staff and moving her legs upon command. On January 15, surgeons performed a tracheotomy, replacing the ventilator tube with a smaller one inserted through Giffords's throat to assist independent breathing. Ophthalmologist Lynn Polonski surgically repaired Giffords's damaged eye socket, with additional reconstructive surgery to follow. Giffords's condition improved from "critical" to "serious" on January 17, and to "good" on January 25. She was transferred on January 21 to the Memorial Hermann Medical Center in Houston, Texas, where she subsequently moved to the TIRR Memorial Hermann to undergo a program of physical therapy, occupational therapy and speech therapy. Medical experts' initial assessment in January was that Giffords's recovery could take from several months to more than one year. Upon her arrival in Houston, her doctors were optimistic, saying she has "great rehabilitation potential". On March 12, 2011, Giffords's husband informed her that six other people had been killed in the attack on her, but he did not identify who they were until months later. In late April, Giffords's doctors reported that her physical, cognitive, and language production abilities had improved significantly, placing her in the top 5 percent of patients recovering from similar injuries. She was walking under supervision with perfect control of her left arm and leg, and able to write with her left hand. She was able to read and understand, and spoke in short phrases. With longer efforts, she was able to produce more complex sentences. From early in her recovery, Giffords's husband had expressed confidence that she would be able to travel to the Kennedy Space Center, Florida, to witness the launch of his final Space Shuttle mission, STS-134, which was originally scheduled for April 2011. On April 25, Giffords's doctors gave her medical clearance to travel to Florida for the launch, originally scheduled for April 29. She went to Florida where she was to watch from a private family area, without any public appearance or photography. The launch of STS-134 was delayed due to mechanical problems, and Giffords and Kelly returned to Houston after meeting with President Obama, who had also planned to see the launch with his family at Kennedy Space Center (KSC). After continuing her rehabilitation therapy in Houston, Giffords returned to KSC for her husband's launch on May 16, 2011. Kelly wore his wife's wedding ring into space, which she had exchanged for his. Giffords underwent cranioplasty surgery on May 18, 2011, to replace the part of her skull that had been removed in January to permit her brain to swell after the gunshot to her head. Surgeons replaced the bone with a piece of molded hard plastic, fixed with tiny screws; they expected that her skull would eventually fuse with the plastic's porous material. At that point, Giffords no longer needed to wear the helmet that she had been wearing to protect her brain from further injury. On June 9, 2011, Giffords's aide Pia Carusone announced that while Giffords's comprehension appeared to be "close to normal, if not normal", she was not yet using complete sentences. On June 12, two photos of Giffords taken on May 17 were released, the first since the shooting. On June 15, Giffords was released from the hospital to return home, where she continued speech, music, physical and occupational therapy. On August 1, she made her first public appearance on the House floor to vote in favor of raising the debt limit ceiling. She was met with a standing ovation and accolades from her fellow members of Congress. A Giffords spokesman, Mark Kimble, stated in August 2011 that the congresswoman was walking without a cane and was writing left-handed, as she did not have full use of her right side. On October 6, Giffords traveled to Washington for her husband's retirement ceremony, where she presented him with the Distinguished Flying Cross medal. She returned to her husband's Texas home. On October 25, she travelled to Asheville, North Carolina, for intensive rehabilitation treatments, ending November 4. In Kelly's memoir, Gabby: A Story of Courage and Hope, released in November 2011, he reported that Giffords would return to Congress. She continues to struggle with language and has lost fifty percent of her vision in both eyes. On January 22, 2012, Giffords announced in a video statement that she intended to resign her seat so that she could continue to focus on her recovery. She attended President Obama's 2012 State of the Union Address on January 24, and formally submitted her resignation on January 25. Appearing on the floor of the House, after the last bill she sponsored was brought to a vote and unanimously passed, Giffords was lauded by members of Congress and the majority and minority leaders who spoke in tribute to her strength and accomplishment in an unusual farewell ceremony. Her letter of resignation was read on her behalf by her close friend and fellow Democratic representative, Debbie Wasserman Schultz. Giffords voted against President Bush's Economic Stimulus Act of 2008. Giffords was one of 60 lawmakers who voted against the Emergency Economic Stabilization Act of 2008 during its first House vote before switching to a yes vote in its second House vote, and she voted for the American Recovery and Reinvestment Act of 2009. In August 2011 she voted in favor of raising the debt ceiling. Giffords argues that Americans are competing on a global level and that this competition starts in the classroom. She is a critic of the No Child Left Behind law, viewing it as an unfunded federal mandate. She supports public schools and their improved efficiency. Giffords strongly supports renewable energy, in particular solar energy, as a top public policy priority. In September 2007, she published a report titled: The Community Solar Energy Initiative, Solar Energy in Southern Arizona, observing that Arizona has enough sunshine to power the entire United States. It reviews current energy usage and discusses how to increase the production of solar electricity. On August 1, 2008, she wrote to congressional leaders regarding tax credits that were set to expire, saying that failure to extend the scheme would be extremely harmful to the renewable energy industry "just as it is beginning to take off." Arizona's 8th Congressional District is one of ten in the country bordering Mexico. Giffords has stated that the Arizona SB 1070 legislation is a "clear calling that the federal government needs to do a better job" and says that she hopes the legislation acts as a wake-up call to the federal government. However, she stopped short of supporting the law itself, saying that it "does nothing to secure our border" and that it "stands in direct contradiction to our past and, as a result, threatens our future." She also claimed that SB1070 kept Arizona from attracting students and businesses. On August 31, 2010, Giffords praised the arrival of National Guard troops on the border: "Arizonans have waited a long time for the deployment of the National Guard in our state. Their arrival represents a renewed national commitment to protecting our border communities from drug cartels and smugglers." Giffords worked to secure passage of the August 2010 bill to fund more Border Patrol agents and surveillance technology for Arizona's border with Mexico. The legislation passed the House of Representatives only to be sent back by the U.S. Senate with reduced funding. Ultimately a $600-million bill was passed and signed into law. The bill was over $100 million less than Giffords fought for, but she said, "This funding signals a stronger federal commitment to protect those Americans who live and work near the border." In 2008, Giffords introduced legislation that would have increased the cap on the H-1B visa from 65,000 per year to 130,000 per year. If that were not sufficient, according to her legislation, the cap would have been increased to 180,000 per year. The bill would have allowed, at most, 50% of employees at any given company with at least 50 employees to be H-1B guest workers. Giffords said the bill would help high-tech companies in southern Arizona, some of which rely on H-1B employees. However, Giffords's bill was never voted on by the House of Representatives. In 2008, before being shot, Giffords opposed Washington D.C. prohibitions on possession of handguns in the home and having usable firearms there, signing an amicus brief with the U.S. Supreme Court to support its overturn. In January 2013, Giffords and her husband Mark Kelly started a political action committee called Americans for Responsible Solutions whose mission is to promote gun-control legislation with elected officials and the general public. The couple supports "keeping guns out of the hands of dangerous people like criminals, terrorists, and the mentally ill". Other proposals from Giffords and Kelly include limiting the sale of certain magazines, limiting the sale of assault weapons, and stopping gun trafficking. Giffords was a surprise witness at a Senate Judiciary Committee hearing on gun violence on January 30, 2013. In a halting voice, she called for Congress to pass tougher laws on guns, saying "too many children are dying." Giffords is right-handed; her speech therapist had to write out her statement for her since her right arm was paralyzed in the shooting. On September 6, 2012, Giffords led the Pledge of Allegiance at that evening's meeting of the Democratic National Convention. In January 2013, Giffords still had difficulty speaking and walking, and her right arm was paralyzed. She continued to undergo speech and physical therapy. On January 8, 2014, Giffords marked the three-year anniversary of the shooting by going skydiving. Giffords said on an interview with the Today show, "Oh, wonderful sky. Gorgeous mountain. Blue skies. I like a lot. A lot of fun. Peaceful, so peaceful." After her shooting, Giffords became an advocate for anti-gun-violence causes. In 2017, after the Las Vegas shooting that killed 58 and injured 546, she implored lawmakers to take action, saying she “knows the horror of gun violence all too well". Giffords married U.S. Navy Captain and NASA astronaut Mark E. Kelly on November 10, 2007. Kelly was the Space Shuttle's pilot on the STS-108 and STS-121 missions, and was the commander of STS-124 and STS-134. Giffords is a former member of the Arizona regional board of the Anti-Defamation League. After Hurricane Katrina struck in August 2005, Giffords spent time as a volunteer in Houston, Texas, in relief efforts for hurricane victims. She wrote about her experience in the Tucson Citizen. Giffords is an avid reader, and was featured on NPR's Weekend Edition on July 9, 2006, talking about her love of books. She was periodically interviewed in 2007 together with Illinois Republican Peter Roskam on NPR's All Things Considered. The series focused on their experiences as freshman members of the 110th Congress. A joint memoir by Giffords and Kelly, Gabby: A Story of Courage and Hope, with co-author Jeffrey Zaslow, was published on November 15, 2011. Giffords and Kelly were interviewed by ABC's Diane Sawyer in their first joint interview since the shooting, which aired on a special edition of 20/20 on November 14, 2011, in conjunction with the book's publication. It was announced by Secretary of the Navy Ray Mabus, on February 10, 2012, that the next U.S. Navy littoral combat ship would be named USS Gabrielle Giffords (LCS-10). Rep. Giffords, still recovering from injuries sustained in the 2011 assassination attempt, attended the ship's keel-laying ceremony and etched her initials into a plate welded into the ship. USS Gabrielle Giffords was christened at the Austal USA shipyard in Mobile, Alabama, on June 13, 2015. Rep. Giffords attended the christening ceremony, along with Second Lady of the United States Jill Biden, who served as the ship's sponsor. The ship was commissioned on June 12, 2017, at Port of Galveston, Texas. Some conservative commentators questioned the decision to name the ship after Giffords, with two retired U.S. Navy and U.S. Marine Corps officers criticizing a perceived recent trend toward naming ships for political reasons. In response, some commentators have noted that several ships in the U.S. Navy, including Henry M. Jackson, Carl Vinson, John C. Stennis, Jimmy Carter, Ronald Reagan, and George Bush were named for prominent politicians who were still alive at the time of the naming. A subsequent Navy report on the naming noted that Secretary Mabus considered honoring Giffords and other victims of the Tucson shooting by naming LCS-10 after the city of Tucson, consistent with current practice of naming littoral combat ships for U.S. cities, but this was not possible because USS Tucson, an active Los Angeles-class submarine, currently bears the name. ^ a b "About Gabrielle Giffords". Gabrielle Giffords for Congress. Archived from the original on January 16, 2011. Retrieved January 19, 2011. ^ a b c d e f g h Denise Grady; Jennifer Medina (January 14, 2011). "From Bloody Scene to E.R., Life-Saving Choices in Tucson". The New York Times. Retrieved January 15, 2011. ^ a b "Doctors: Wounded Arizona congresswoman able to communicate". CNN. January 9, 2011. Retrieved January 9, 2011. ^ a b Lacey, Marc; David M. Herszenhorn (January 9, 2011). "In Attack's Wake, Political Repercussions". The New York Times. Retrieved January 11, 2011. ^ "U.S. prosecutors charge gunman accused of assassination attempt on Arizona Rep. Giffords, killing 6". The Star-Ledger. Associated Press. January 9, 2011. Retrieved January 12, 2011. ^ "US congresswoman in critical condition after shooting". msnbc.com. January 8, 2011. Retrieved January 8, 2011. ^ Bookman, Jay (January 8, 2011). "Federal judge wounded in AZ; congresswoman shot". The Atlanta Journal-Constitution. Archived from the original on January 11, 2011. Retrieved January 8, 2011. ^ "Giffords to resign from Congress". FoxNews. January 22, 2012. Retrieved January 22, 2012. ^ "Giffords resigns House seat to focus on recovery from gunshot wound to head". The Toledo Blade. Associated Press. January 25, 2012. Retrieved June 12, 2016. ^ Stolbert, Sheryl Gay; Yardley, William (January 15, 2011). "For Giffords, Tucson Roots Shaped Views". The New York Times. ^ "Congresswoman Gifford's Hollywood Connection to Paltrows". January 9, 2011. ^ a b "Biography". Archived from the original on January 6, 2011. Retrieved January 8, 2011. ^ ""Many prayers are interceding for your recovery" | Scripps College Alumna Gabrielle Giffords". Community.scrippscollege.edu. Archived from the original on July 7, 2012. Retrieved January 6, 2012. ^ "Giffords campaign website". Archived from the original on April 21, 2007. Retrieved May 8, 2007. ^ Ya'ar, Chana. "Jewish US Lawmaker Gabrielle Giffords Shot, Prognosis Optimistic". Arutz Sheva Israel National News. Retrieved January 9, 2011. ^ Kampeas, Ron (January 8, 2011). "Arizona congresswoman Gabrielle Giffords shot in the head". The Jewish Journal of Greater Los Angeles (JTA). Retrieved January 9, 2011. ^ "Right-Wing Agenda Will Obscure our Most-Pressing Issues". Tucson Citizen (republished on candidate's web site). January 10, 2006. Archived from the original on November 9, 2006. Retrieved November 12, 2006. ^ "Flunkies – The Sierra Club grades the Arizona Legislature". Candidate's web site. June 12, 2006. Archived from the original on November 9, 2006. Retrieved November 12, 2006. ^ "Track Record". Candidate's web site. June 12, 2006. Archived from the original on November 9, 2006. Retrieved November 12, 2006. ^ "EMILY's List Announces Endorsement of Gabrielle Giffords for Arizona's 8th Congressional District". Emily's List. June 14, 2006. Archived from the original on November 8, 2006. Retrieved November 9, 2006. ^ Sunnucks, Mike (June 13, 2006). "Democratic contender gets support in House race". Phoenix Business Journal. Retrieved November 9, 2006. ^ Gelbart, Debra Morton (November 30, 1999). "Jewish woman takes Arizona seat". JTA.org. Retrieved October 25, 2012. ^ Hulse, Carl; Zernike, Kate (January 8, 2011). "Bloodshed Puts New Focus on Vitriol in Politics". The New York Times. Retrieved January 9, 2011. Ms. Giffords is the first Jewish woman elected to the House from her state. ^ "Election Summary Report". Pima County, Arizona. November 10, 2010. Retrieved January 12, 2011. ^ "Gabrielle Giffords wins re-election in Arizona". AZCentral.com. November 5, 2010. Retrieved November 6, 2010. ^ "Top 10 "Tea Party' Candidates to Watch". AZCentral.com. September 21, 2010. Retrieved October 9, 2010. ^ Rowley, James (January 10, 2011). "Giffords Is Centrist Who Defies Political Labels". Bloomberg. Retrieved January 11, 2011. ^ House Session, Jan 6, 2011. C-SPAN. January 6, 2011. Event occurs at 1:55:48 – 1:56:10. Retrieved January 12, 2011. ^ "WATCH: Arizona Rep. Gabrielle Giffords Read 1st Amendment On Floor". Arizona's Politics. January 6, 2011. Retrieved January 20, 2011. ^ "REP. GABRIELLE GIFFORDS CALLS FOR SECURE BORDERS, IMMIGRATION REFORM IN FIRST FLOOR SPEECH; WRAPS UP FIRST FULL WEEK AS A MEMBER OF THE 110th CONGRESS". United States House of Representatives. January 12, 2007. Archived from the original on January 16, 2011. Retrieved January 19, 2011. ^ "REP. GABRIELLE GIFFORDS VOTES TO EXPAND FEDERAL FUNDING FOR LIFE-SAVING STEM CELL RESEARCH". United States House of Representatives. January 11, 2007. Archived from the original on January 16, 2011. Retrieved January 19, 2011. ^ a b c "REP. GABRIELLE GIFFORDS WRAPS UP THE "100 HOURS AGENDA" WITH VOTES TO MAKE U.S. ENERGY INDEPENDENT AND COLLEGE MORE AFFORDABLE". United States House of Representatives. January 18, 2007. Archived from the original on January 16, 2011. Retrieved January 19, 2011. ^ THOMAS Search Results: H.R.1441. Library of Congress. Retrieved March 9, 2008. ^ House Votes Again To Ban Sales Of F-14 Parts To Iran. Aero-News Network, June 13, 2007. Retrieved March 9, 2008. ^ a b "Profile: Gabrielle Giffords". BBC News. January 9, 2011. Retrieved January 12, 2011. ^ Stanton, Billie. Stanton: Democrats damned by Iraq war vote. Tucson Citizen June 5, 2007. Retrieved March 9, 2008. ^ "Senate rejects border funding; U.S. Rep Giffords is outraged". KGUN9 Tucson. July 26, 2010. Archived from the original on October 7, 2010. Retrieved October 11, 2010. ^ "Solar energy, immigration top congresswoman's priorities". San Pedro Valley News-Sun. December 30, 2008. Retrieved October 11, 2010. 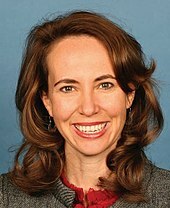 ^ http://higgins.house.gov/services/congress-on-your-corner | "Congress on Your Corner"
^ "Congresswoman Gabrielle Giffords Shot In Arizona". NPR. January 8, 2011. Retrieved January 8, 2011. ^ "Arizona Congresswoman Giffords shot in Tucson". The Arizona Republic. January 8, 2011. ^ "Profile of Jared Loughner: 'I can't trust the current government'". msnbc.com. January 8, 2011. Retrieved January 8, 2011. ^ Alexander Burns & Matt Negrin (January 9, 2011). "Federal charges could carry death penalty". Politico. ^ "Suspect charged in congresswoman's attack". msnbc.com. Associated Press. January 9, 2011. ^ Tim Gaynor and Peter Henderson (January 9, 2011). "Suspect charged with attempted assassination of Giffords". Reuters. ^ Lah, By Michael Martinez and Kyung. "Loughner pleads guilty to 19 counts in Tucson, Arizona, mass shooting - CNN.com". ^ Williams, Mary Elizabeth (January 10, 2011). "The Giffords shooting's gay, Hispanic hero". Salon. Retrieved January 15, 2011. ^ Morrison, Patt (January 10, 2011). "Two gay heroes thwart assassinations – what a difference 35 years make". Los Angeles Times. Retrieved January 15, 2011. ^ Foley, Elise (January 10, 2011). "Heroic Giffords Intern Could Be Asked For Papers Under Arizona Immigration Law". The Huffington Post. Retrieved January 15, 2011. ^ "Arizona congresswoman among 12 shot at Tucson grocery". CNN. January 8, 2011. Retrieved January 8, 2011. ^ a b Gupta, Sanjay (January 10, 2011). "Gupta: What helped Giffords survive brain shot". CNN. Retrieved January 11, 2011. ^ O'Connor, Anahad (January 19, 2011). "Giffords's Husband Heard His Wife Had Died in Tucson". The New York Times. Retrieved January 19, 2011. ^ a b "Doctor: Giffords may be showing 'glimmers of recognition'". CNN. January 13, 2011. Retrieved January 14, 2011. ^ Carollo, Kim (January 9, 2011). "Gabrielle Giffords in Medically Induced Coma to Help Brain Rest". ABC News. Retrieved January 9, 2011. ^ Allen, Jonathan (January 9, 2011). "Aide: Gabrielle Giffords is 'sort of alert'". Politico. Retrieved January 9, 2011. ^ "Doctor: Giffords has '101 percent chance' of surviving". msnbc.com. January 11, 2011. Retrieved January 12, 2011. ^ Brown, David (January 11, 2011). "Bullet path may decide Giffords's fate". The Washington Post. Retrieved January 11, 2011. ^ Branigin, William (January 11, 2011). "Doctors: Gabrielle Giffords able to breathe on her own". The Washington Post. Retrieved January 11, 2011. ^ "Obama: Rep. Giffords "Opened Her Eyes" Today". CBS News. Associated Press. January 12, 2011. Retrieved January 13, 2011. ^ Fischer, Howard (January 17, 2011). "Replacing Giffords called speculation". Yuma Sun. Archived from the original on February 9, 2013. Retrieved January 18, 2011. ^ Maugh, Thomas H., II (January 16, 2011). "Rep. Gabrielle Giffords taken off ventilator". Los Angeles Times. Retrieved January 17, 2011. ^ Poole, Brad (January 15, 2011). "Doctors open breathing hole in Giffords's throat". Reuters. Retrieved January 16, 2011. ^ Leinwand, Donna (January 17, 2011). "Husband: Giffords smiles, rubs his neck". USA Today. Retrieved January 17, 2011. ^ "Giffords undergoes successful operation to repair eye socket". CNN. January 17, 2011. Retrieved January 17, 2011. ^ "Kelly: Injured Giffords cares for others". United Press International. January 17, 2011. Retrieved January 17, 2011. ^ a b Cohen, Elizabeth (January 26, 2011). "Giffords moves to rehabilitation hospital". CNN. Retrieved January 26, 2011. ^ Martinez, Michael (January 21, 2011). "Giffords arrives in Houston". CNN. Retrieved January 21, 2011. ^ a b Rose, Jaimee (April 24, 2011). "Gabrielle Giffords' doctors, husband share details on her progress". The Arizona Republic. Retrieved April 25, 2011. ^ "Spokesman: Giffords recovering part of her ability to speak". CNN. February 9, 2011. Retrieved February 9, 2011. ^ "Spokesman says Rep. Giffords plans to return to Florida to watch husband's shuttle launch". The Washington Post. Associated Press. May 2, 2011. Archived from the original on December 26, 2018. Retrieved May 3, 2011. ^ "Astronauts in Fla. for next-to-last space shuttle flight, Endeavour patched, in 'great' shape". The Washington Post. Associated Press. May 12, 2011. Archived from the original on December 11, 2018. Retrieved May 12, 2011. ^ "Doctors OK Rep. Gifford's trip to husband's shuttle launch". The Indianapolis Star. Associated Press. April 25, 2011. Retrieved April 25, 2011. ^ "Doctors say Giffords can attend husband's shuttle launch". Reuters. April 25, 2011. Retrieved April 25, 2011. ^ Shauk, Zain (May 16, 2011). "500,000 gather to see launch of Endeavour". Houston Chronicle. Archived from the original on July 27, 2011. Retrieved August 2, 2011. ^ "Successful surgery to repair skull" Archived December 7, 2018, at the Wayback Machine. The Washington Post, May 20, 2011. ^ Hensel, Deborah Quinn (May 18, 2011). "Giffords recovering from cranioplasty in Houston". Reuters. Retrieved June 12, 2011. ^ Montini, E. J. (June 9, 2011). "Gabrielle Giffords' staffer talks about congresswoman's health". The Arizona Republic. Retrieved June 9, 2011. ^ Plushnick-Masti, Ramit; Amanda Lee Myers (June 12, 2011). "First post-shooting photos of Giffords released". The Ledger. Associated Press. Retrieved January 25, 2012. ^ Cappon, Colleen; Doyle, Jessica Ryen (July 8, 2011). "Doctor: Gabrielle Giffords Could Return to Congress". Fox News Channel. Retrieved July 8, 2011. ^ a b "Giffords returns to House for debt vote". CNN. August 1, 2011. Retrieved August 1, 2011. ^ Mascaro, Lisa (January 26, 2012). "Rep. Gabrielle Giffords sees her last bill pass, says farewell". Los Angeles Times. Archived from the original on January 26, 2012. Retrieved January 26, 2012. ^ "Vote switchers on financial bailout". USA Today. October 3, 2008. Retrieved May 3, 2010. 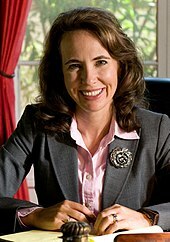 ^ "Stimulus bill deserved my vote | Congresswoman Gabrielle Giffords". Giffords.house.gov. February 22, 2009. Archived from the original on July 7, 2010. Retrieved July 11, 2010. ^ "Gabrielle Giffords — Education". The Political Guide. Retrieved January 20, 2011. ^ "The Science Coalition". Archived from the original on January 15, 2011. Retrieved May 5, 2009. ^ Giffords, Gabrielle (September 2007). "Solar Energy in Southern Arizona: Executive Summary" (PDF). Archived from the original (PDF) on July 22, 2011. ^ Schuster, John. "Power Play | Currents Feature". Tucson Weekly. Retrieved July 11, 2010. ^ "Democrats call for elimination of Arizona's new immigration law". CNN. April 28, 2010. ^ "Giffords statement on Arizona's new immigration law and the us border". April 30, 2010. Archived from the original on August 4, 2010. Retrieved August 10, 2010. ^ "U.S. Rep. Gabrielle Giffords' Statement On Arrival Of National Guard Troops On The Arizona–Mexico Border". August 31, 2010. Archived from the original on October 7, 2010. Retrieved October 11, 2010. ^ "U.S. Rep. Gabrielle Giffords Welcomes President's Signing Of Border Security Bill". August 13, 2010. Archived from the original on October 7, 2010. Retrieved October 11, 2010. ^ "Bill Text – 110th Congress (2007–2008) – THOMAS (Library of Congress)". Thomas.gov. March 13, 2008. Retrieved January 8, 2011. ^ "With Unemployment Near Ten Percent, Giffords Seeks Importation of More Cheap Foreign Labor". FAIR. October 15, 2009. Archived from the original on October 31, 2009. Retrieved October 26, 2009. ^ a b Gross, Grant (March 14, 2008). "Bill Would Double Cap on H-1B Visas". PC World. Retrieved April 20, 2010. ^ "Brief for respondent District of Columbia v. Heller 07-290" (PDF). ^ "Criminal Background Checks". Americans for Responsible Solutions. April 3, 2013. Archived from the original on February 18, 2013. Retrieved April 3, 2013. ^ "Giffords, NRA battle over gun control". Anchorage Daily News. January 30, 2013. Archived from the original on February 3, 2013. Retrieved January 31, 2013. ^ a b Benac, Nancy (January 30, 2013). "With halting voice, Giffords speaks out on guns". Associated Press. ^ Murray, Matt (January 9, 2014). "'One of the strongest women ever': What #GoGabby means to you". TODAY. ^ Nicks, Denver (January 9, 2014). "WATCH: Gabby Giffords Skydives to Celebrate Life". TIME Magazine. ^ Faherty, John (June 1, 2008). "Congresswoman's husband now in orbit". Azcentral.com. Retrieved January 8, 2011. ^ "ADL Condemns Attack on U.S. Rep. Gabrielle Giffords; Calls for Thorough Investigation into Motives of Shooter". Archived from the original on January 10, 2011. ^ "Giffords campaign website". Archived from the original on April 22, 2007. Retrieved May 8, 2007. ^ "Books to Make the Most of Her Personal Space". NPR. July 9, 2006. Retrieved January 19, 2011. ^ "Perspectives on the Change in Power". NPR. January 4, 2007. Retrieved January 19, 2011. "First Re-Election Bids Require Balancing Act". NPR. October 24, 2007. Retrieved January 19, 2011. ^ Rose, Jaimee (November 15, 2011). "Giffords, Kelly detail recovery 10 months after shooting". USA Today. Retrieved January 25, 2012. ^ "Giffords memoir due". New York Post. Associated Press. September 7, 2011. Retrieved September 8, 2011. ^ Morabito, Andrea (September 12, 2011). "Diane Sawyer Gets First Sit-Down With Gabby Giffords". Broadcasting & Cable. Retrieved September 12, 2011. ^ Finch II, Michael (April 16, 2014). "Gabrielle Giffords signs initials onto future littoral combat ship bearing her name". AL.com. Retrieved November 2, 2015. ^ a b "Navy Christens Littoral Combat Ship Gabrielle Giffords" (Press release). U.S. Department of Defense. June 11, 2015. Retrieved June 11, 2015. ^ a b "Navy ship christened for former Arizona Rep. Giffords". The Arizona Republic. June 13, 2015. Retrieved September 27, 2015. ^ "Navy Commissions USS Gabrielle Giffords". U.S. Department of Defense. Retrieved June 14, 2017. ^ "Former military brass 'shocked,' 'angered' over USS Gabrielle Giffords". ^ Farley, Robert (February 10, 2012). "USS Gabrielle Giffords (LCS-10)". Retrieved March 28, 2013. ^ Iskra, Darline (February 27, 2012). "More on Ship-Naming Controversies: About the USS Gabrielle Giffords". Time Inc.
^ Olson, Wyatt (June 19, 2015). "From Hope to Giffords: The Navy's long history of unconventional ship names". Stars and Stripes. Retrieved October 23, 2015. Wikimedia Commons has media related to Gabrielle Giffords. "Giffords Community Solar Energy Initiative" (PDF). Archived from the original (PDF) on July 22, 2011. Retrieved May 6, 2009. "Congresswoman Giffords Action Plan to Improve Border Security" (PDF). Archived from the original (PDF) on July 22, 2011. Retrieved October 12, 2010.